If you’ve got toddlers and preschoolers you know it can get overwhelming meeting all their needs all day long. It’s a privilege, but it makes for a super tired mom. Here are some things you’re probably doing for your kids that you can stop. As a mother of four kids, the oldest will turn 4 years old this week, some of the best advice I’ve ever received was to not do for your kids what they can do on their own. I’m telling you, I internalized this early. It is fairly easy to do every single thing for one child and even two, but the more kids you have the more you realize that you don’t have the time to do every little thing. Kids actually enjoy accomplishing tasks on their own. One of my children’s favorite phrases said with joy and a huge smile is, “Look mom, I did it by muhself!” I’m here to tell you, it brings me as much joy as it brings them. While this is not an exhaustive list, here are things that I allow (and sometimes require, depending on the situation) my children to do on their own as soon as they are able. You may think some of these are nuts, but it works for us. Remember, however, it isn’t a problem unless it’s a problem for you. Get dressed. I have one child who always wants to dress herself, and another who makes the biggest deal about it. He gives one attempt at putting his arm through the hole then falls backwards and whines, “I can’t, mommy!” Because of this we really try to focus on helping him persevere. I’ll stand beside him and guide him, but he feels so victorious when he’s done it so I try to let him even if it takes 5 minutes. Take off their clothes. Before bath I ask mine to take off their own clothes. Sometimes they can and sometimes they can’t depending on the fit of the outfit, but they give it a go. Help fix their own sandwich. My kids like to spread their own jelly and peanut butter. I will say this is largely an exercise in frustration for the younger one, but they try and I let them. Put their plates in the sink. After the kids have eaten they are always to clear their own area. So they’ll put their cups and plates either in the sink (if it’s plastic), beside the sink (if it’s glass), or in the trash (if it’s disposable). And without being told they know which is which and don’t break anything! Get their own water. Some refrigerators give you access to water within arm’s reach which is good. You can magnetize a cup or clip them on the refrigerator too. 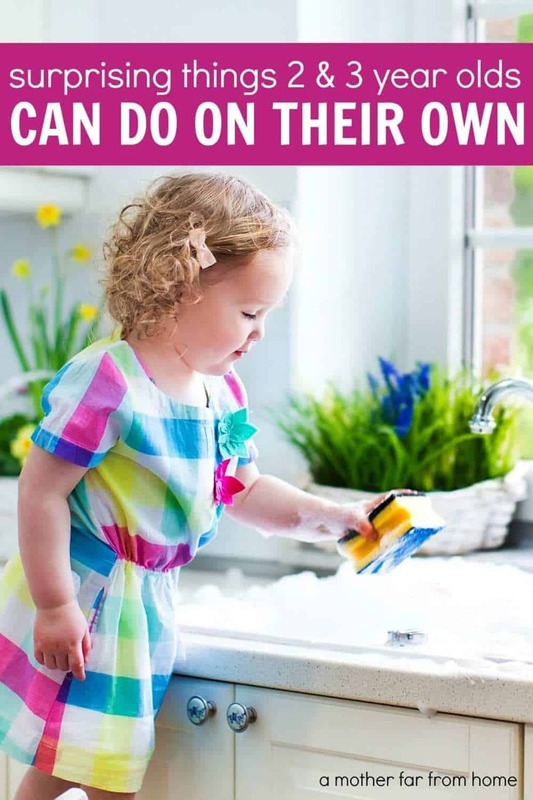 Ours does not, however, and my kids will push a stool (sometimes 5 feet) to the kitchen sink. Climb the stool, fill their cup, climb down, push the stool back, then drink their water. Honestly. And they smile the whole time. Empty the dishwasher. If they are old enough to be careful and don’t have to carry plates and glasses far, I think emptying the dishwasher with some supervision is totally possible. Wipe their area. Kids make a mess while eating often times and that’s okay. I can’t pay that close attention to every mouthful of my kids so after they’re done eating we’ll pass them a wet rag and let them wipe it up. It isn’t perfect, but it communicates to leave an area clean. Bathe themselves. Now, hold on a minute, I’m not saying leave them in the bath alone at all. But as they are in the bath and playing you can let them begin to wash themselves. Of course you’ll have to go behind them to make sure it’s all clean if they didn’t get in all the right places, but mine also like to have control over where the soap goes since they don’t want it in their eyes. Make their bed. Mine aren’t able to actually fix their sheets and comforters, but I fold those and then they straighten their pillows and toys. Fold towels. My daughter is pretty good at folding towels. When we’re folding laundry I’ll separate the towels and smaller blankets for her to fold. They aren’t perfect, but remember Type A mom, they don’t have to be! Walk instead of ride in the stroller. Again, I discovered this out of necessity, but once my kids turn 2 they pretty much don’t get to ride in the stroller. Sorry not sorry. Double strollers can get super heavy and hard to push, particularly postpartum. We’ve walked all over major cities, through parks, done a 5k, been sightseeing, and run errands with the little ones walking. Of course I’ll stop and hold them or give them a break if they complained but you know what? They never ever do. Okay I could go on, but the list is getting long and plus I’d love to hear from you. What do your 2 and 3 year olds do on their own? 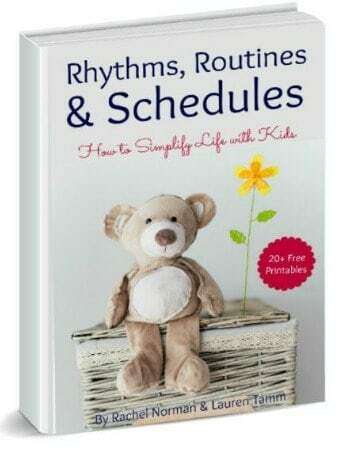 If you (and your little ones) struggle with routine and sleep, this book is for you. It has over 25+ routines for children ages newborn to 5 years old. Get more information here. Absolutely love these additions, Melissa! YES. I like that about putting things up inside the door when coming home, too, because that’s often the type of messes that are big. When everyone comes in and throws stuff down. I have to do a lot of coaching with one of mine but it’s so honestly worth it! Totally with you on the teach a man to fish school of thought. Jessie, WHY DO THEY NOT WANT TO PUT CLOTHES ON!! I will tell you my 4 year old (turned 4 today) prefers pajamas. I honestly don’t fight it every day, but when we DO need to get dressed I’ll make her. Ha. I like this about what our 2-3 year olds can do. Mine also lay the table and say the prayer for the meals! Really quite cute! Our 2 year old has also learned to feed herself earlier than her brother who is now 3 did! Thanks for the tips! Just read this with my newly 3 year old. You know, the whole, “See mommy’s not the only one who says you are old enough to do this.” : ) He was very excited to know he’d been doing these things for a while. My daughter ( who will be 3 next month) goes into the fridge in the morning and gets her yogurt, the drinkable kind, goes into the cabinet for a straw, pokes it in the hole herself and there’s breakfast! She’s been doing this for months and it’s a huge help while I’m nursing the baby in the morning! Stacy that is AWESOME. Actually, I think I need to move some stuff around in our pantry to allow this to happen because that morning nursing period is tough. A baby wants to feed, the other kids want to eat and you only have so much time. Good tip! That’s a good idea actually! Mine have yet to try to go in the fridge, but when they do I will remember that! Thanks Rachel for this post! It came with perfect timing! I’ve been at a crossroads with my just turned 3yr. old, and was realizing that he really is capable of a whole lot more than I gave him credit for :) Yesterday for the first time he folded his own and little brothers pants and also washcloths, and he was soooo proud of himself! It makes him so much happier if he can help work. You are so right, they actually LIKE to feel accomplished. Here we are getting frazzled doing things for them when they’re happy to. Ha! My two oldest kiddos (now aged 4 and 2 1/2) do many of these things too! Yay! A few weeks ago I realized that I had slacked off on making them pick up their toys after playing with them. This meant that our main areas looked like a cyclone had hit after a couple hours of playtime! It was just so much faster for me to pick the toys up than to make the kids pick up. And then, when I’d try to encourage them to pick up, it was incredibly tedious work, and I was frustrated because it felt like the kiddos were just lazy or not obedient or whatever. My husband observed all this and noted that perhaps we had never really trained them what it meant to clean up. So he took the oldest under his wing and spent perhaps 20 minutes working with Duplo blocks. “Here is how you clean up. You pick up a block in your hand, then move your hand over to the bucket, and drop the block in. Should you play with the blocks? No. Should you put blocks together? No. Just pick up the block, move your hand over the bucket, and drop it in. And you keep doing it until all the Duplos are picked up.” All very lovingly and patiently, of course. Well, my son “got” it. Over the next few days, I helped both older kids identify what needed to be picked up in a room and then assigned particular groups of toys (one picks up trains and the other picks up track, for example). We would race to see who could pick up their group first. Now both kids get it! Like, at least three times in the last week the living room has been strewn with matchbox cars, trains, little plastic animals and trees, and various other books and toys and I have heard the kids talking amongst themselves to figure out who should pick up what. And I have come into that room later and EVERYTHING is cleaned up! It’s beautiful. Gives me a complete and total boost. My husband is now a supervisor at work and has been going through supervisor training. Often there are supervisees who have trouble following orders. My husband is being trained to ask these questions in that case: 1) are my expectations clear? and 2) does this person have the necessary skills and resources to complete this task? (There was another question but I can’t remember it right now). Anyway, this really applies to our kiddos. In the case of the failure to pick up, my husband identified that the kids hadn’t been given the skill of picking up, and proceeded to train them in that. Wow! What I thought was a character problem (obedience, laziness) was just a lack of skill. So now I’m trying to remember those questions when it seems like the kiddos should know what to do and aren’t following directions, whether it’s picking up, or coloring a picture, or eating neatly. Maybe I need to slow down and train them in the needed skill. And giving them these skills will help them throughout their lives! Thanks so much for posting this because it’s so true. I’ve found that too, that sometimes it isn’t they are trying NOT to do what we say, but that they aren’t quite sure what we want. “Clean up” is clear to us, but can be overwhelming when faced with a big fat mess. Great points here, Christy! Great post! My boy is 20 months old. He is capable of doing many interesting things. He puts forks and spoons in the dishwasher, wipes floor as water or milk pours, throws used tissue papers in the recycle bin, and even brings garbage to the door. However, the cutest is his expertise in peeling onions. I am from iran, we use onion in most foods, and he is a great help to me. How cute about the onions. Do his eyes water? Ha! My 3.5 year old loves to vacuum and mop. He begs to clean the toilet and the bathroom sink. I follow up to make sure the details are done right but he gets the first go at it. He also likes to help pull weeds in the garden and water the plants. I love your lists! My 3 years old is doing most listed, and she loves it very much! She will take dirty plates and drop into sink (only if reminded), she will offer to wipe spills (always see me doing that), will offer to clean table after making a cake (always see me doing that), put het clothes into laundry basket(need reminder), brush her teeth, gargle and spit (she will spend 30min gargling if i allow), pick her own clothing, return toys (if i do it with her) and so on. I always believe we go with the pace of the child, if she is not ready, dont force it but if she is or at least want to try, let her! You will be amaze on how determine she is to complete the chore only if she is given a chance to! Jennie, I am so with you on this. I often see what they start and help them finish. It’s about having them feel they are able and then letting them do it. I think it works wonders! I like this list a lot and I also think it is important to add that you much take time for training. You likely do a great job of showing them how to do these things and then allowing them to practice. I wouldn’t want someone to read this and think that your children were able to do any of these things if you hadn’t shown them how to. I am compiling a list for my parents in my preschool classroom… many of the 3’s are still not doing lots of these things.